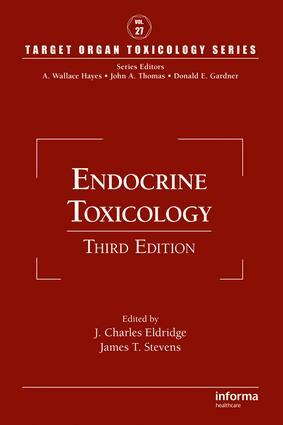 Regulation of Endocrine Disruptive Chemicals in the United States. Pursuit of Endocrine Disruptors in Europe - the OECD Component. Impact of Endocrine Disruptor Policies and Regulations. The Hypothalamic-Pituitary-Gonadal Axis in Teleost Fish. The Hypothalamic-Pituitary-Gonadal Axis in Anuran Amphibians. The Hypothalamic-Pituitary-Gonadal Axis in Birds. The Hypothalamic-Pituitary-Gonadal Axis in Mammals. Comparing and Contrasting the Hypothalamic-Pituitary-Gonadal Axis in Different Vertebrate Classes. Male Reproductive Endpoints and the Rodent Hershberger Assay. Review of Bisphenol A by the National Toxicology Program. Pubertal Screening Assays in Rodents. Endocrine Disruption at Neuroendocrine and Neurotransmitter Sites. Endocrine Disruptor Interaction with Estrogen Receptors. Analysis of Endocrine Disruptors with Estrogen Reporter Systems. Time Dependent Embryotoxicity of the Endogenous Luteolysin, Prostaglandin F2alpha, in Ruminants. Actions of Endocrine Disruptors on the Thyroid Axis. Endocrine Disruption of Hormone Storage and Transport. Metal Toxicity in Mammalian Reproduction. Structure-Activity Modeling of Endocrine Disruptors. Overview of Endocrine Disruptor Ecotoxicity in Wildlife. Overview of USEPA Tests with Aquatic Vertebrates for Detecting and Assessing Endocrine Disrupting Chemicals. Biological Activity of Endocrine Disruptors in Aquatic Systems. Impact of Endocrine Disruptors on the Water Industry.